Let us enjoy the pAsuram. mayanga valampuri vAy vaiththu – emperumAn projected arjuna merely as the motive for the battle. When the enemies were not put down by arjuna’s arrows, krishNa would blow his pAnchajanyam (divine conch). Anyone who hears it, whether they are friends or enemies, would become perplexed. Enemies would become fearful on hearing its pitch and get perplexed about what will happen to them while friends will worry as to what will happen to emperumAn and become perplexed. SrI bhagavath gIthA 1-19 says “sa ghOsha: dhArthrAshtrANAm hrudhayAni vyadhArayath” (the sound of krishNa’s conch broke the heart of dhrutharAshtra’s sons into smithereens). SrIvishNu purAnam 5-21-29 says “yasya nAdhEna dhaithyAnAm balahAnirajAyatha, dhEvAnAm vavrudhE thEja: prasAdhaSchaiva yOginAm ” (by hearing the tone of which pAnchajanya, demons suffered loss of strength, dhEvas became more radiant and yOgis (rishis) became extremely happy…). Thus ithihAsam and purAnams speak about the strength of pAnchajanyam’s tone. vAnaththu iyangum eri kadhirOn thannai – radiant sUrya (sun) who is journeying in his orbit in the skies. Sun is in a place where he cannot be hidden and he does not stop in one place but keeps moving about. emperumAn hid such a splendorous sun whose rays burn down people [who are at a great distance from him] who cannot see him with their eyes directly. muyangu amarauL – in the battlefield where people are very close to each other [lot of people were in the battlefield]. The meaning conveyed here is that he had many people as witnesses to his actions. nammAzhwAr says in thiruvAimozhi 7-5-9 “dhEsam aRiya” (for the whole world to know). thErAzhiyAl maRaiththadhu en nI – chakkaram (disc) is referred to as “rathAngam” (part of chariot) in samskrutham (Sanskrit). AzhwAr uses the same term in thamizh as thErAzhi (wheel of chariot). Why did you hide the sun with your divine disc? While you are neutral to everyone, is it proper on your part to do this only for the sake of arjuna? vEdhas refer to emperumAn as “sathya sankalpa” (one who is true to his words). When vEdhas call you sathya sankalpa, is it proper on your part to deceive people? [the reference here is to the act of krishNa in creating darkness by hiding the sun with his sudharSana (divine disc) so that jayadhratha would come out of hiding and enable arjuna to kill him]. Is your act synchronous with your own words in mahAbhAratha uththara kAndam 70-48 “na mE mOgham vachO bhavEth” (my words will never be false)? Will it be appropriate to your being the divine entity? Or will it be appropriate to the human form that you took when you incarnated yourself? thirumAlE – the one who raises the questions [AzhwAr], answers them himself by calling him as thirumAlE (consort of mahAlakshmi). Since mahAlakshmi is biased towards her devotees, thirumAl (one who is in a state of stupor with mahAlakshmi) also shows this quality towards his followers. pOr Azhik kaiyAl porudhu – you had taken part in the battle with your weapon. In the previous verse, it was mentioned that he had hidden sun with his divine disc. He would have carried out that action with his sankalpam (divine will), viz. he did not carry the disc in his hands to hide the sun. But that was not the case with bhIshma (great grandfather of both pANdavas and kauravas, the main protagonists in the battle). 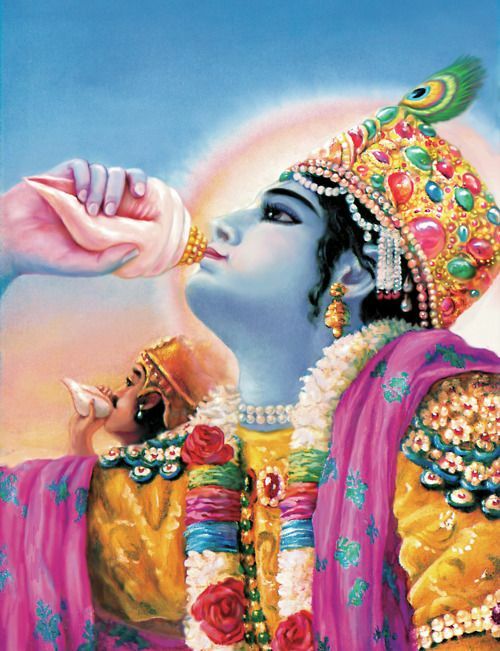 krishNa had taken a vow that he will not hold any weapon in the battlefield. bhIshma had challenged him saying that he will make krishNa take to his weapons. AzhwAr is now asking emperumAn as to why he took his weapon (disc) while going after bhIshma in the battle? The subtle meaning conveyed here is that in order to fulfil the words of his bhaktha (devotee; bhIshma in this context), he will go against his own word! We shall consider the 9th pAsuram next. This entry was posted in iyaRpA, mudhal thiruvandhAdhi on June 17, 2017 by T N Krishnan.